Last year Dirty Projectors released a tortured breakup album, Dirty Projectors, that chronicled the acrimonious 2016 split between band mastermind David Longstreth and singer-guitarist Amber Coffman. Its heavy-handed retelling was from Longstreth's point of view, since Coffman had quit the group—joining Angel Deradoorian and Olga Bell on the list of crucial members who've left Dirty Projectors since 2012. The 2017 album features longtime drummer Mike Johnson, plus instrumental support from members of New York chamber ensemble yMusic, modular synth maven Tyondai Braxton, and Brazilian percussionist Mauro Refosco, among others—Longstreth has never had trouble recruiting extra hands. But he handled the lion's share of the playing himself—vocals, guitar, keyboards, bass, programmed beats—and also arranged the string and horn parts. The music is characteristically dense, with rich harmonies and dizzyingly complex arrangements, but it's much more sterile than usual for Dirty Projectors—while breakup albums are rarely joyful, this one feels bereft of anything but analytical finger pointing, its emotional color oddly cold. 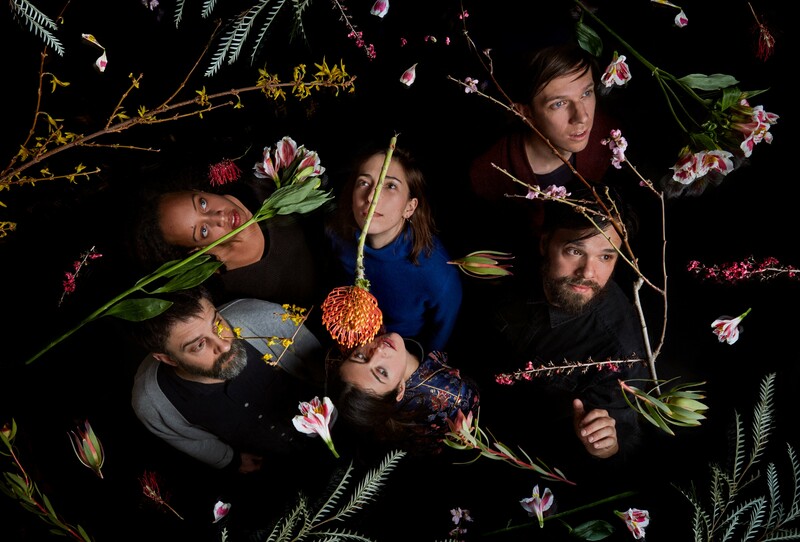 Thankfully Longstreth seems to have worked the pain and recrimination of the breakup out of his system, and Dirty Projectors' forthcoming Lamp Lit Prose (due in July on Domino) is as giddy, infectious, and fun as anything the band's ever made. The band are in the middle of a U.S. tour to promote the release, and their road lineup consists of Longstreth, Johnson, and longtime bassist Nat Baldwin, plus three new members: singer-percussionist Felicia Douglass, singer-guitarist Maia Friedman, and singer-keyboardist Kristin Slipp (also of Cuddle Magic). On the album, a revolving cast supports Longstreth. On the album's first single, "Break-Thru" (embedded below), grafts skittering beats and woozy synth blobs to sparkling guitars that have a bubbly, joyfully chattering sound reminiscent of East African music, especially benga. The vocal harmonies have all the complexity and sophistication I've come to expect from Dirty Projectors, and countermelodic shapes burst between them like fireworks. Most of the songs feature vocal cameos, from folks as disparate as the sisters in Haim, Odd Future's Syd, and the team of Robin Pecknold (Fleet Foxes) and Rostam Batmanglij (Vampire Weekend). They pair effervescent harmonies with Longstreth's syllable-crammed phrasing on the earnest folk-flavored opener, "Right Now," and the early-80s Michael Jackson homage "I Feel Energy," which stokes its ebullience with compressed horns. Longstreth's music often feels calculated and schematic—his perfectionism, ambition, and outsize technical ability can overwhelm the more universally human qualities in his work. But I've been listening to the tunes on Lamp Lit Prose for a week now, and they've not only opened up to me but also opened me up—the opposite effect as the previous album. Dirty Projectors headline Thalia Hall on Tuesday evening. The new Dirty Projectors LP combines familiar elements in the most peculiar ways.